Roze-Verdict: If you find “stupid” funny and weirdly witty jokes funny, then it’s a MUST WATCH. Plot: Detective Jake Peralta is one of the best in his department showing his love for putting away bad guys and solving puzzles. The only puzzle he hasn’t solved, is how to grow up. Once a new captain is appointed to the department, Peralta has to learn to respect the rules. Andy Samberg as Detective Jake Peralta. Stephanie Beatriz as Detective Rosa Diaz. Terry Crews as Sergeant Terry Jeffords. Melissa Fumero as Detective Amy Santiago. Joe Lo Truglio as Detective Charles Boyle. Chelsea Peretti as Administrator Gina Linetti. Andre Braugher as Captain Ray Holt. I didn’t even know Andy Samberg had a comedy show coming out up until I saw the Jame Franco Comedy Central Roast, and watched him get constantly roasted about it getting cancelled within the first month (LOL). I knew I had to watch it especially after Samberg’s hilarious “roast”, I don’t think many people got it but he totally channeled into my sense of humor which is why I was pretty stoked that his brand of humor totally comes out in Brooklyn Nine Nine. I think there was a lot of negativity about this show, just because so many shows get cancelled every year and why would this be different right. From the pilot alone I’m expecting some great things from the show. First of all the cast is awesome, we have the likes of Andy Samberg, Chelsea Peretti and Joe Lo Truglio who rarely fail to get laughs and their combo of funny is a match of gods. That is if their brand of humor resonates with you. The mix of overconfident, immature, boorish, eccentric behavior that exudes when their characters clash makes for a lot of funny situations and jokes. We also have Terry Crews who is a legend for many reasons, first being his sensual peck flexing and of course his badassness in general. We are also gifted with the casting of some lesser known actors who have just as big roles as the others, not breaking stride. I think for a comedy series to be successful it needs to have an ensemble cast so that there’s a lot to play with in terms of character development and subplots. A lot more ideas can be generated when there’s more characters than just a few, this way we aren’t getting the same old generic episode plots. Of course there are the likes of “Two and a Half Men” and “2 Broke Girls” which seem to thrive but eventually the characters get dull. What I like about Brooklyn Nine Nine is that we’re given a large cast of different personalities and characteristics which opens up a massive door of joke opportunities which they utilize successfully making for a hilarious show. The characters are likable and interesting resulting in a fun and relaxing watch. Based on the pilot I thought that each episode would present a case that the characters would have to solve, which posed a problem for me. If they were to go in that direction, 1) 21 minutes is not enough to sell a smart-ish crime plot, 2) what’s stopping it from becoming a carbon-copy of CSI but in spoof form and 3) eventually it would get boring. Luckily the show doesn’t emphasize too much on the crime solving but more on the wacky office antics. 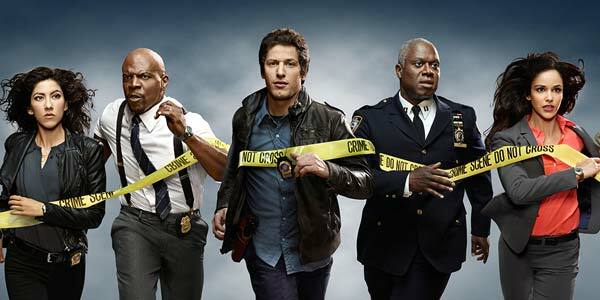 If I was to find a description for Brooklyn Nine Nine, I would say it’s a cross between Archer and The Office with an awesome theme tune (not an overstatement). Just because we have a protagonist who feels he can do what he wants for being the best, who is surrounded by odd sometimes incompetent colleagues and the one perfectionist (Lana = Santiago). But then we have the humor of The Office and borderline Family Guy because, well a lot of the time they’re in the office doing a lot of dumb crap. This entry was posted in Pilot Reviews and tagged 1, America, Andre, Andy, Beatriz, Braugher, Brooklyn, Brooklyn Nine Nine, Chelsea, Comedies, Comedy, Cop, Cops, Crews., Detective, Fox, Fumero, Joe, Lo, Melissa, New York, Nine, Opinion, Peretti, Police, Precinct, Rating, Review, Rozeminho, Samberg, Season, Series, Stephanie, Television, Terry, Truglio, TV, USA, Verdict by rozeminho. Bookmark the permalink.